There are times when the person I should fear most is my own self. It is “me” who takes over and wreaks havoc with my heart and my conscience when I choose to indulge anger or fear. It is “me” who comes up with ridiculous schemes to advance my agendas, hide my weaknesses, or protect my heart. Who knows me better than I know myself? Who knows my weaknesses and my hot buttons as well as I do? Only I know how easily I can build a wall around my heart, set a gate, apply a deadbolt and lock it. I know how I operate. I know how to breach the trust I place in God and surrender to myself. The reality is that I am my own worst enemy when the Lord is not my stronghold; when I think I must secure my own fortifications against personal attack, persecution, or pain. When I am the sole protector of my life, I try to insulate my soul. I am focused on me, my safety, my comfort, my timetable, my wants, my needs, my plans – me, me, me. That’s also when I tend to hurt other people – I misunderstand their needs, motives, actions and words because everything is out of focus. How can I bring anyone else into focus when the eyes of my soul are focused on defending me? Oh yes – that is especially true when I am the wicked one who is advancing against me – when I am the enemy – when I am the foe. I will stumble and fall, but before I do, I will beat myself up, wall myself off, and convince myself that I am worthless, helpless and hopeless. I will fill my own heart with fear. Fear is a ferocious enemy. Fear manipulates and twists words and understanding. Fear causes me to want to double-bolt every gate in every wall. Fear pushes me into darkness. Fear clouds my thoughts and keeps me from making wise decisions. Fear forces me into a corner. Fear is a choice. It is a choice that I don’t have to make – but I need the Lord to be my stronghold if fear is to be fended off. “Oh soul, are you weary and troubled? I’ve been struggling with fear lately, and I’ve been singing this hymn to my grandson as a lullaby. I didn’t realize I was singing to myself. I had built a wall big and high, the gate was hung and it was slamming closed. However, it was closing out someone I love. I saw myself trying with all my might to push the gate open, but my fear seemed stronger; and fear was closing it. I know that I have focused on myself, wanting to protect myself, but at what cost? 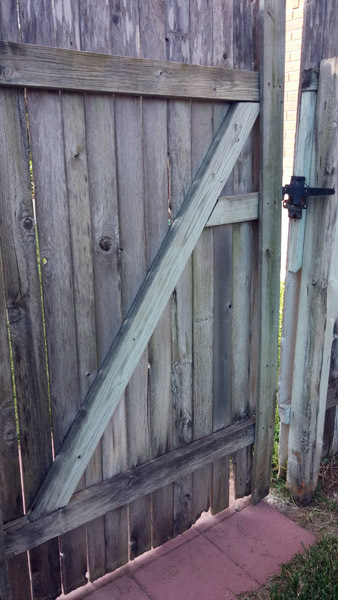 I can only keep the gate open, and begin dismantling the wall, if Jesus is my stronghold, if I turn my eyes upon Jesus. When I turn my eyes upon Jesus, I see who he is – the Rock of my Salvation, my Redeemer, the Alpha and the Omega, the First and the Last, the Living One, the Word who was with God, who was God, who was and is and is to come. This Jesus – the eternal Son of God and Son of Man, the One who was dead and now lives – this Jesus loves me and lives in me! This Jesus wants to live his life through me. This Jesus wants me to unconditionally love the people he has placed in my life. This Jesus defeats fear. When I see Jesus more clearly, I also see myself more clearly. Self-protection must not be the goal of my life. “I” am not the purpose of my life. Jesus is. Our safety is not found in the rickety walls we attempt to build. Our safety is found in Jesus’ tent. Is Jesus the stronghold of your life? If he is, then whom shall you fear? Love this!! Psalm 27:4 is one of my favorites!!! It’s so easy to think me me and me.